Are the Jets and Bills preparing to work together tonight? For weeks, reports have steadily emerged indicating the Jets would not be averse to trading down from No. 3 overall. That prospect has gained steam Thursday, with GMs expecting Gang Green to have buyers for their pick. The Bills might be one of them. The Jets are a decent bet to trade down tonight, Rich Cimini of ESPN.com tweets, adding one team is under the impression New York already has a deal in place. Teams don’t make a habit of intra-division first-round trade agreements, but Jason La Canfora of CBS Sports notes (on Twitter) the Bills may be considering moving up to acquire Quinnen Williams. Cimini mentions Williams as a key part in the Jets’ potential trade-down scenario, so if the Cardinals and 49ers choose Kyler Murray and Nick Bosa — as they are expected to — we could have a trade shortly after. Linked to just about every other key player atop this draft, the Raiders are now connected to Bosa. They may be interested in moving up to select the Ohio State-honed pass rusher, Dan Graziano of ESPN.com notes (via Rotoworld’s Evan Silva, on Twitter). With the 49ers expected to take Bosa at No. 2 overall, the Raiders would seemingly have to trade into the Cards’ No. 1 spot to pull this off. Vic Fangio‘s previous team used the No. 8 overall pick to nab Roquan Smith. He may have a similar wish this year. The Broncos‘ first-year coach “very badly” wants Devin Bush to spearhead his new linebacking corps, La Canfora notes. Denver cut its top coverage linebacker, Brandon Marshall, earlier this year and has a need for a three-down inside ‘backer. The Steelers made calls about possibly trading up for a defender, but they may be resigned to the fact they will not be able to add one of their targets. They do not view Bush as an attainable player, per JLC (on Twitter). With the Broncos linked to Bush at 10, the Steelers would have to likely jump at least 11 draft slots to be in strong position to land the Michigan linebacker prospect. Vanderbilt-produced cornerback Joejuan Williams has risen into first-round consideration, and the Chargers are intrigued, per La Canfora. The Bolts do not boast a plethora of dire needs, putting them in position for a best-player-available pick at No. 28. Although the Eagles brought back Timmy Jernigan, they are still going to be in the market for a possible first-round defensive tackle, Jeff McLane of Philly.com tweets. The Eagles are fairly stacked on their defensive front, especially having added Malik Jackson this offseason, but they have been mentioned as a candidate to add another lineman in Round 1. If the Giants address their pass rusher and quarterback needs tonight, they may be hoping to help their secondary on Friday. They should be expected to consider a safety either in Round 2 or Round 3, per ESPN.com’s Jordan Raanan (on Twitter). Big Blue acquired Jabrill Peppers this offseason but has needs everywhere else in its secondary. With hours to go before the 2019 NFL Draft, the Cardinals’ plans for the No. 1 overall pick remain shrouded in secrecy. 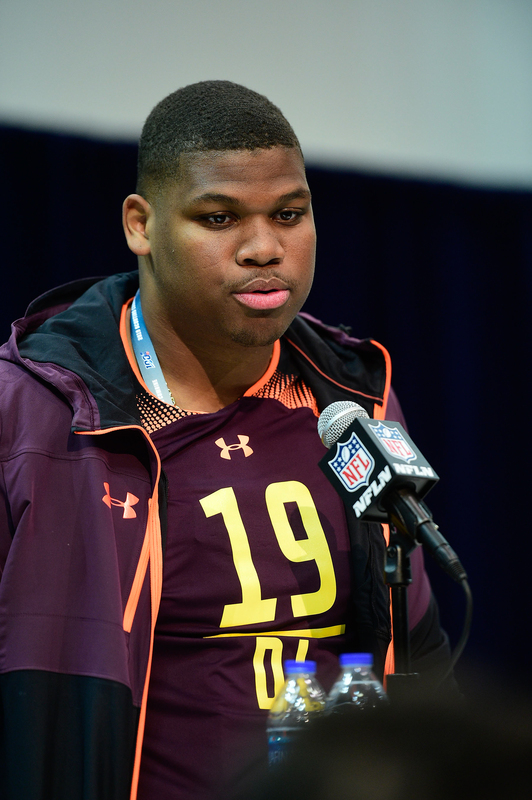 Just recently, Cardinals GM Steve Keim reached out to Alabama defensive tackle Quinnen Williams to let him know he’s still a possibility to go first overall, Ian Rapoport of NFL.com (on Twitter) hears. At this point, only GM Steve Keim and a few others know the identity of the top pick, Steve Wyche of NFL.com reports (on Twitter). It still sounds like Kyler Murray will be the pick, but no one knows for sure, especially since there have been no trade talks surrounding Josh Rosen at this time. Further complicating matters is a split of opinions in the Arizona front office about whether Rosen and Murray could co-exist on the roster together. One team source tells Josina Anderson of ESPN.com (Twitter link) that the situation would not work after Rosen was selected to be Arizona’s QB of the future just one year ago. Another team source, however, feels that it could work.